My variation on the recipe on the box of Kraft Minute Tapioca. I learned the tapioca thickener trick from my mother. Mix together the rhubarb, strawberries, tapioca, zest or peel, and sugar. Stir thoroughly and let sit for at least 15 minutes. 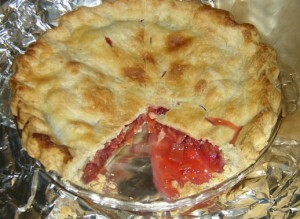 Divide dough in halves, roll out bottom crust, and place gently in pie plate. Do not stretch dough when fitting into pan. 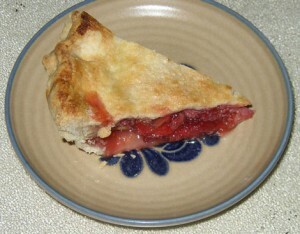 Dump all the rhubarb/berry mixture into the crust. Distribute evenly. Dot with butter cut into small pieces. Roll out top crust and gently set over the pie. Fold edges together, seal, and crimp. Make a few slashes in top crust to allow steam to escape. Decorate with extra dough pieces if desired. Brush on milk or egg wash and sprinkle lightly with sugar. Bake for 45-50 minutes or until slow bubbles of the filling are visible through the slits. Allow to cool completely on a rack (approx. 2 hours) before cutting.